Previous Article Did Suffragettes set fire to yacht? At Bonar Law’s funeral in Westminster Abbey on November 5 1923, Herbert Asquith stated, with a certain satisfaction, that 'the unknown Prime Minister' was being buried by the side of the Unknown Soldier. That phrase has been used as as epitaph to the man who was prime minister for only 211 days, the shortest tenure in the twentieth century. But he was a man of political importance. No one found Bonar Law charismatic — he was too reserved for that — but he was anything but dull. A junior minister, Lord Winterton, soon decided that he was 'a most lovable man in whom one could place complete trust'. A civil servant, J.C.C. Davidson, who was amazed by his powers of industry, judged that he 'misled many people into the belief that he was weak because his manner and voice were so gentle, and his heart so kind'. Conservative colleague Stanley Baldwin described him, publicly, as 'a most lovable, elusive and wistful personality', while privately declaring 'I loved the man'. 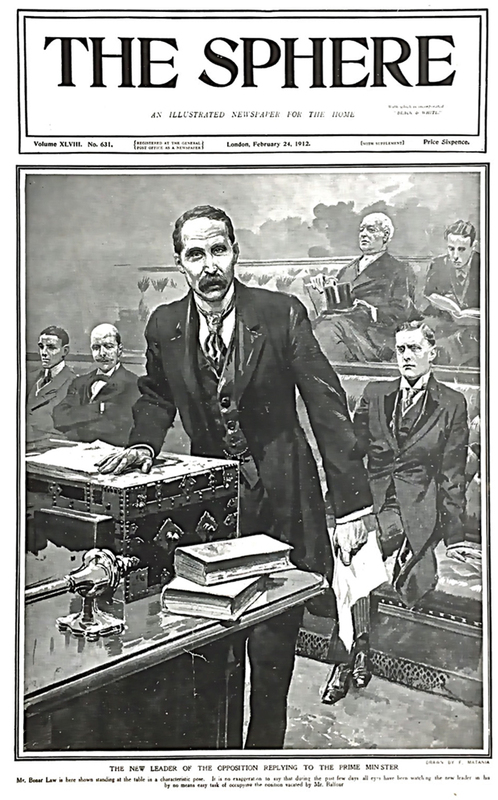 Bonar Law succeeded Arthur Balfour as leader of the Conservative party in November 1911. He was not just a new leader but a new type of leader, and his election at the Carlton Club marked a new chapter in the history of the Conservatives. in 1900, aged 42, he won a hitherto safe Liberal seat in Glasgow. Within 18 months he was made parliamentary secretary at the Board of Trade, and soon he was one of the key figures on the Conservative front bench. 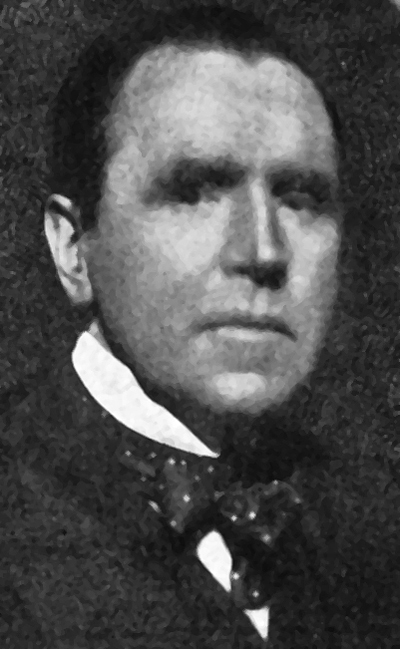 He lost the Glasgow seat, but in 1911 was returned at a by-election in Bootle, and the following year he was elected unanimously to succeed Balfour. His rise to power had been remarkable, which was why he made the front page of what was described as “an illustrated newspaper for the home”. As Prime Minister, Bonar Law occupied 10 Downing Street for just 209 days in 1922-23, succeeding the much better known Liberal, David Lloyd George, who had served from 1916-22. A heavy pipe and cigar smoker, he died of cancer of the throat on October 23. Very much a pictorial newspaper, printed on thick glossy page, The Sphere was sold in London for six pence and posted to subscribers throughout the UK at a halfpenny a copy. Page 2 recorded that it had an American office at 7 East 42nd Street in New York, and also contained public notices, listings of hotels including The Hydro at Bridge of Allan, and advertisements for cruises and holidays abroad — even a trip to Australia on the Orient Line. Page 3 was the main news page, and listed Events of the Week. At Home these included the English Conciliation Board meeting to discuss ways of settling the coal dispute, the death of Mr Graham Gilmour while flying at Richmond, the marriage of Lord Howard de Walden to Miss Margharita Van Raulte in London, and Mr Thomas Hardy presenting his manuscript of ‘Wessex Poems’ in Birmingham. Abroad included the launch of a new German battleship, the King of Spain giving practical help to the people of flooded Seville, a polar expedition being organised in America, and the Chinese Republic adopting a new national flag. Picture stories included the opening of a new approach to Southwark Cathedral, the Ridley Art Club’s 25th anniversary exhibition at London’s Grafton Galleries, Balfour arriving at Cannes Golf Club but refusing to talk about politics, and a bronze statuette gifted by the German Emperor to War Secretary Lord Haldane on a visit to Berlin. Page 4 was a page of pictures and statistics about coal production and the strike threat, while the next page was a full-page image of “The Virgin and Child, St Joseph, and Another Saint’ by the Italian artist Andrea Mantegna sold in Berlin to Monsieur Kleinberger of Paris for £29,500 — a huge sum in 1912. The next two pages featured ‘Navy Notes of the Week’. The intro read: ”A reliable rumour has it that it has been decided to include in this year’s naval estimates a sum of £20,000 for an extension of the accommodation at Greenock and a further £90,000 for the explosive establishment near Rosyth Dockyard. Other pages include F.Matania’s drawing of Lord Kitchener, the new British Agent in Egypt, arriving in Cairo in carriage with two bare-footed guards running in front, plans for a new harbour in Canada, and a page of photos of scenes at London theatres. A two page spread featured Glasgow Boy artist John Lavery (later Sir John) who painted in his younger years in Helensburgh and Rosneath. The paper described him as "one of the greatest artists of the present day." A page of pictures of ladies in elegant gowns was headlined: ’Is the Dress of the Modern Woman Beautiful?’ — the implication being that the answer is yes. Then there are the advertisements for, among other things, holidays, jewellers, garages, tyres and pianos. Cosmetic products include Scrubb’s Ammonia — try it in your bath, Pears Soap enables a good complexion, Calox — the oxygen tooth powder, and Shem-el-Nessim — The Secret of an Ideal Toilet. All in all, it gives a fascinating insight to life in Britain two years before World War One. But apart from the front page, there was no further mention of Andrew Bonar Law!